The Twisted Ladle: To Brine or Not to Brine? In my third year in Ottawa, I decided to stay there and make Thanksgiving dinner on my own. Turkey was always one of those recipes that was up on a pedestal. Every show on tv always had that one thanksgiving where someone burns the outside of the turkey and has the inside raw or frozen. Or better yet, the bird looks beautiful but the meat is dry. Needless to say, I was a little nervous about making the turkey perfect. I knew from my family that turkey had to be basted often to prevent drying out. I don't believe in stuffing a turkey. The heat and time needed to cook the stuffing to a safe temp would increase the risk of drying out. That first time I made a basic turkey. I filled the cavity with herbs and rubbed the outside with salt pepper and a little garlic. The end result was delicious with me obsessively basting every half hour. The final product was delicious. The main problem was in how little gravy was produced. After the first half hour, there was no liquid to baste with. I countered this problem by adding a glass of water the first year, and a glass of chicken broth the second year. That year started what would become a tradition. Over the next 4 years, Thanksgiving at my place would become a tradition. In year 3 I was watching some random TV while working on homework. I ended up seeing an Alton Brown special where he was talking about something called brining. The idea seems to be to soak the turkey in ice water, broth, and spices. 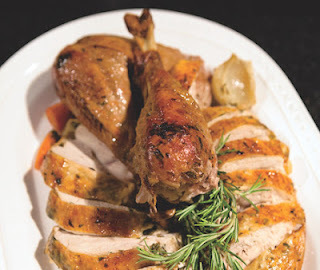 The idea is to infuse the meat with enough moisture to guarantee a moist bird. I decided to give it a try. The end result was amazing. The bird was so filled with juice that I ended up with a good jug of gravy and a perfect bird. I fell in love. In the questions of to brine or not to brine, for me the question is easy.... Brine! That being said, both options have their disadvantages and advantages. Not brining has the advantage that it needs less prep. You can defrost the bird the night before and not have to worry about it till the morning of. The lack of gravy and juice can be mitigated by adding water or broth early on and using that to baste at the very beginning. With brining you have to be ready to work the night before serving. You want to brine for about 8-12 hours. You will need ice, salt, hot and cold water, and broth, along with the right container to soak the bird. My first two times using this method, I used a band new outdoor garbage can that I purchase from a home hardware for this purpose alone. The last time, I used a cooler that I got from my parents. The advantage of the cooler was a little bit more portability. My favourite aspect of brining is that this is a great way to infuse flavour into the meat. Whatever flavour you want in the meat should be in the brine. I love adding lots of honey and adding a great kick of sweetness. Before roasting, I rub down the turkey with a butter mixture that has lots of garlic, paprika, pepper, and some cayenne. The little extra fat helps to brown the skin a bit more, while the spice flavour gives the meat that little kick.